The sports doctor told me about this a while ago. I think it's just about the coolest thing ever: a fantastic slushy-consistency ice pack for bumps and bruises. And now that it's summer, there are bound to be a few of those here and there. I like this better than the ones available for sale because the slushy consistency lets it contour around an injury. And there are only two ingredients, one of which comes out of your faucet. 2 cups of rubbing alcohol and 6 cups of water in a one-gallon zip-lock bag. Freeze. This is great for knees, backs, and large injuries. 3/4 cup of rubbing alcohol and 2 cups of water in a one-quart zip-lock bag. This size is great for hands, elbows, and child-sized injuries. Don't put a lot of pressure on the ice pack. After all, zip-lock bags are only so strong before they pop open! I double-bag ours, just to be sure. Also, it helps to push all the air out of the bag before you seal it. Put a layer of fabric or a thin towel between the ice pack and your skin to prevent frostbite. I made this little pillowcase-style flannel cover for ours because I thought it would give the right amount of protection. Tsia is also a lot more interested in using an ice pack if it looks pretty. Keep the ice pack on the painful area for about 20 minutes to reduce inflammation. 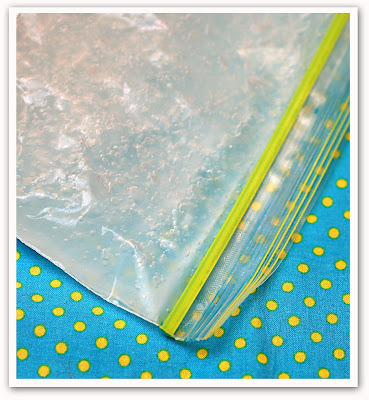 Store the ice pack in your freezer so it's ready for use anytime. Wow - this is so clever, and it looks gorgeous. Thanks so much for sharing. I'll definitely have to make some of these - my 2 1/2 year old is always covered in bruises and she might actually use an ice pack if she can choose the fabrics! This is a great idea--thanks for the recipe. I have one of those vacuum sealers which I'll bet would work great to ensure that it didn't leak. This is great! I've tried everything from crushed ice to frozen peas, but nothing is quite slushy enough. I'll try this next time one of the kids gets a booboo, which I'm sure will be sooner than later. Liesl, thank you! My chiro just told me that I needed to be icing my shoulder and I do not have any gel pacs, so this is the perfect solution. I am going to make on tonight. thanks for the great recipe for owies! Very good idea, I love it and will be making both sizes soon. I'm even thinking this would make great birthday gifts for my friends who are mothers! Thanks for the wonderful tip and the great idea. We love those ice packs around here but I had no idea how easy there were to make with household regulars. Summer knees thank you! I think I just bumped my elbow on my sewing machine.... uh.... er.... 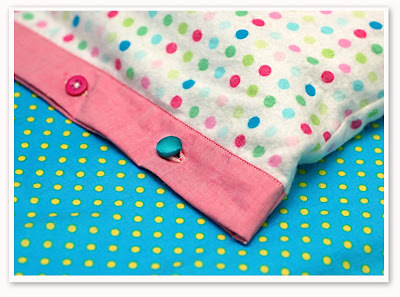 I think I need THAT ice pack to make it all better - yeah, that one, with the pretty fabric and buttons. Thanks so much for this great idea and the recipe! The thought of the gel always creeps me out a bit, so this is perfect! Our dog chewed through our last shop bought one! That is amazing. I am going to have to make some of these for my little guy, he is just full of bruises, since he has been learning to walk. Thank you for sharing. Do you freeze it in the flannel case? Thanks for sharing this idea. It sounds like you have a good doctor, our doctor told us to use a bag of frozen veggies (boring!) I like yours and the little slip case better. Thanks for sharing. I really liked your article. Keep up the good work. This is a great idea! Now ice packs can be colorful and not those drab gray ones! I actually saw this on The Revolution yesterday but couldn't remember the alcohol to water ratio. Thank you. I plan to use it, just to give myself a bit more confidence in the flimsy ziplock seal. Worked like a charm...my only change, I added two straps w/velcro. That way when my girls move around (like they are going to sit still for 20 min) their ice pack is mobile. I have done this before but I use my food saver bags, they are a little more sturdy and almost leak proof. These are great thanks for posting I couldn't remember the water to alcohol ratio. I have made this ice pack, and put a washcloth between my foot and the ice pack. Your idea is wonderful! I will be making some because I have Plantar Fasciitis and have to ice my foot several times a day. Thanks for dropping by! I'm Liesl Gibson, designer of the Oliver + S and Lisette sewing patterns and fabric collections. This is where I blather on about whatever I'm interested in at the moment, whenever I have a little time to do so.